There are few experiences more wonderous than microscopically viewing the myriad of life forms in a drop of water taken from a ditch, puddle, pond, stream, river, or lake. Whether for the first time, or the hundredth time, one never knows exactly what to expect when peering down the microscope. Initially, the observer is mesmerized by the activity everywhere; algae, protozoans, cilliates, rotifers, worms; everything eating or being eaten; dividing, reproducing, dying; it is impossible not to watch the life-and-death panorama. Anyone who sets up a microscope by a lake, and looks at just one drop taken from floating scum will have their world changed forever; unlike the casual observer, they will “see” every small drop that comprises the lake, and experience the exhilaration of trying to conceive of the total number of life forms; the lake will no longer be just a body of blue or green water, but an enormous universe unto itself. Eventually, however, if one becomes serious about this microscopic world, questions inevitably arise as to what the various microscopic plant and animal life forms are. What are their names? What are their life histories? What do they eat, and what eats them? How do they reproduce? What happens if they dry up? These and hundreds of other questions that come flooding in, all start with identifying what one is looking at. This is the point where the microscope user starts to accumulate illustrated books containing identification keys (1). The microscopic plants will not be as difficult to deal with as the microscopic animals, because the plants, for the most part, are non-motile, or they move slowly, making for relative ease in comparing their morphological characteristics to those described and illustrated in the keys. It is the microscopic animals that will, initially, be difficult to identify, because they tend to move rapidly, and out of the field of view before detailed observations can be made; (incidentally, it is great fun to determine the dimensions of the field of view, time the movement of the microscopic animals with a stopwatch, and then calculate their speed in miles per hour!). What you may now find for some forms is that professional taxonomists have prepared identification keys to distinguish between the various species within a genus based on morphological details of, say, their mouth parts, as in distinguishing the diptera larvae. The fool things do not stay still long enough to observe even their gross structure, let alone their mouth parts! Over the decades, for hundreds of years, however, microscopists in similar situations have worked out ways to physically slow down microscopic animals, or to narcotize them, and then, perhaps, even kill, fix, and preserve them for further morphological studies at a later time. 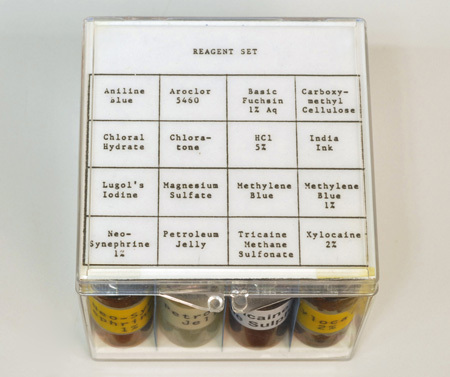 It is the purpose of this article to discuss a number of reagents and ways that have been described to narcotize, slow down, and preserve microscopic and other aquatic animals, so that a field kit or laboratory collection of a select few of these reagents may be assembled for ready use. Non-chemical, physical methods of slowing down microscopic animals fall into three groups: increase of medium viscosity, physical barrier, and mechanical restraint. Of these, increase of medium viscosity is rapid, inexpensive, and effective. The idea here is to thicken the water in which the microscopic animals are moving. Glue-like substances, such as gum Arabic, gum tragacanth, unflavored gelatin, methylcellulose, or carboxymethylcellulose can be added to the microscope slide preparation. Proprietary slowing agents may be solutions of methylcellulose. One such proprietary agent for slowing protozoa is Protoslo™ (Figure 1, left); this clear nonionic “quieting solution” is obtainable from Carolina Biological Supply Company in Burlington, NC, 1-800-334-5551 . I keep solutions of methylcellulose handy in my home lab, but for my aquatic field kit (Figure 2a and 2b), I find it more convenient to carry a small vial of methylcellulose or carboxymethylcellulose powder, and make it up to the desired consistency on the spot; a little can be added directly to the specimen drop under observation. The gums Arabic and tragacanth can be tried for the same purpose. Incidentally, Garnett (2) reminds us that many wallpaper pastes contain methylcellulose, so that this would be a readily available source of the material. A similar effect of thickening the water of the microscope slide preparation is to misuse an aqueous mounting medium. That is, there are a number of water-based mounting media intended for making permanent slide preparations, but since these are miscible with water, they can be added to the sample water in any proportion until the desired thickness is achieved. Mounting media based on carboxymethylcellulose are examples of these. General Biological Supply Company of Chicago– regrettably no longer in business – made both a clear version (CMC), and a “non-resinous stain mountant”. (CMC-S), which contained fuchsin dye (Figure 1, right). 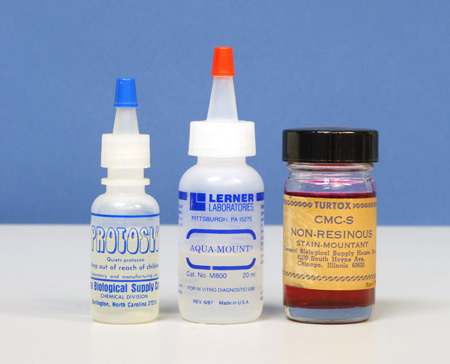 Another aqueous mounting medium is AQUA-MOUNT® (Lerner Laboratories, Pittsburgh, PA); this one is based on polyvinyl alcohol resin, with some glycerol, and less than 1% amino alcohol and cationic quarternary ammonium chloride (Figure 1, center). Physical barrier methods that have been suggested for slowing down microscopic animals include adding teased lens tissue, cotton fibers, glass fibers, or synthetic fiber staple to the preparation. Personally, I do not care for these methods because they make for a crowded, distracting field of view; they may be effective, but they are not aesthetically pleasing. 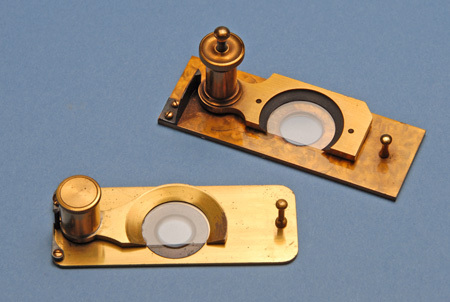 Mechanical restraint methods for microscopic animals go back 150 years or more. 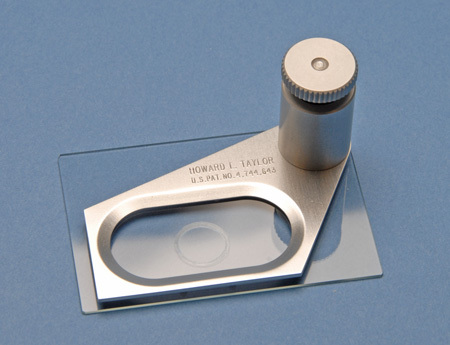 These consist of mechanical devices designed to lower a coverglass in a controlled manner over a microscopic specimen while observing it, until the specimen is just slightly compressed against the slide. Logically enough, these devices are referred to as “compressoria”, a popular design of which is that by Rousselet. Figure 3 illustrates two early examples of the Rousselet Compressorium. The basic idea is very much like a trick used by professional photographers of fish, in which rather than constantly change focus as the fish moves, and waiting for it to turn sideways, the photographer places a pane of glass in the aquarium, and slowly moves it toward the front of the aquarium so as to sufficiently entrap the fish between the two pieces of glass, such that it cannot turn or swim away. In the compressorium, the upper portion holding the fixed coverglass is pivoted out of the way, the drop containing the specimen is placed in the center of the slide, the coverglass is pivoted back over the drop, and the knurled screw is rotated until the lowered coverglass makes contact with the drop, and continues to be lowered until it reaches and compresses the microscopic animal under observation. I used a compressorium like this to hold still a live Daphnia for a photomicrograph by Rheinberg illumination that appeared on the front cover of Kodak’s Biomedical Photography–A Kodak Seminar in Print (3). A modern version of the compressorium has been designed and patented by Howard L. Taylor. One of his designs, known as the Taylor Microcompressor Mark II, is illustrated in Figure 4. He designed this microcompressor for his personal work with rotifers, but a later, specialized modification had a graduated screw so that the volume of the compressed liquid could be determined for quantitative work. Both heat and cold may be used to slow microscopic animals. Heating the slide preparation or adding boiling water is sometimes recommended, but it is not easy to control this method. Hot water has been added to preparations of Hydra in order to kill them with the tentacles in an extended position, after other methods resulted in contraction of the tentacles. Hypothermia may also be used to slow down microscopic, as well as other animals. Nature photographers have refrigerated or otherwise cooled a wide variety of animals so as to quiet them for photography. Decades ago when the first compressed gas cans became available, first for cooling cocktail glasses, then for dusting off photographic lenses, etc. I discovered, by accident, that if the can were inverted, the propellant would ice-up whatever it was directed at. I sprayed a mercury thermometer this way, and found that the temperature would rapidly descend to below freezing in a matter of seconds. I subsequently used this method to repair mercury thermometers whose column had become separated through student mishandling; i.e., by lowering all of the mercury into the bulb through freezing, rather than trying to heat the mercury into the small expansion chamber at the top of the column. At any rate, I then put a drop of water on a microscope slide and sprayed the bottom of the slide with the inverted can, whereupon the water drop immediately froze. This suggested that such compressed gas cans could be used for inducing hypothermia in microscopic animals (4). Narcosis: A state of stupor, unconsciousness, or arrested activity produced by the influence of narcotics or other chemicals. Narcotic: A drug that induces narcosis; in moderate doses it dulls the senses, relieves pain, and induces profound sleep, but in excessive doses causes stupor, coma, convulsions, or death. Anesthesia: A loss of sensation with or without loss of consciousness. Anesthetic: A substance that causes anesthesia. Alcohol, where unspecified, refers to ethyl alcohol (ethanol; grain alcohol). In general, ethanol and dilutions of ethanol should, ideally, be made up from absolute ethyl alcohol. This grade of alcohol is, however, expensive because of the levied tax and it is frequently difficult to obtain. Absolute alcohol can sometimes be bought in small quantities through liquor stores as 200-proof straight grain alcohol. There are many grades of alcohol beneath “absolute”, each “denatured” differently depending upon the intended end use; for example, “cosmetic grade” alcohol is purer than “lacquer thinner”. In a pinch, shellac thinner or even wood alcohol (methyl alcohol; methanol) from a hardware or paint store can be used. Even rubbing alcohol (isopropanol, isopropyl alcohol) can be tried; it has the virtue of being inexpensive. Carbon dioxide can be obtained for slowing many organisms through the simple use of carbonated water (“charged” water; “Seltzer” water), or can be generated on the spot either by exhaling repeatedly through a straw into a small quantity of water, or, more conveniently, through the discharge into a small container of water of a small CO2 cylinder, such as SCUBA divers used to use to inflate their life vests, or that are available in hobby shops for propelling model race cars, etc., and also that are available for charging “Soda Bottles” for use in mixing with liquors. The principle utilized here is asphyxia. A related technique suggested by Locquin and Langeron (5) is to transfer organisms into a hermetically sealed vessel containing water deoxygenated by boiling; this is said to cause death accompanied by relaxation within 24 hrs. Chloral hydrate. This crystalline material is one of the most useful microscopical reagents, used not only as a narcotizing agent, but as a superb clearing agent for plant tissue. Unfortunately, chloral hydrate (“knock-out drops” used in “Mickey Finns”) is now a Schedule IV Controlled Substance; to obtain chloral hydrate a Drug Enforcement Administration Form DEA-222 needs to be completed (rigorously following the directions printed on it), and DEA and State licenses are required. In addition, because of the voluminous record-keeping required, an administrative fee is added to the cost of the chemical. Eucaine. This is a local anesthetic, C15N21NO2, derived from piperidine. It is seldom used now, and when found is usually used as the hydrochloride. Cocaine; cocaine hydrochloride. A Schedule II Controlled Substance (high abuse potential). Again, it is unfortunate that abuse has caused this useful compound to be restricted. The most abused materials seem also to be the most effective and powerful narcotizing agents for biological use. In general, for anyone wishing to continue this line of study, the group of chemicals known as anodynes will be of particular interest; amongst these are cocaine, eucaine, betacaine, stovaine, chloretone, hydroxyline, phenol, camphor, and thymol. Small quantities of many controlled substances are available as chromatographic standards to those with appropriate licenses. An updated Controlled Substances Inventory List is available from the United States Department of Justice, Drug Enforcement Administration, Washington, D.C. 20537. Neo-synephrine® hydrochloride (Winthrop Laboratories). This product is available at most drugstores, in 1/8%, 1/4%, 1/2% and 1% solutions. The 1% is perhaps best, because it can be used full-strength, or diluted. This product has proven to be very effective, especially on microscopic animals. Many SCUBA divers routinely use Neo-synephrine as a nasal decongestant before diving into very cold water, so it is usually available to the diving scientist. 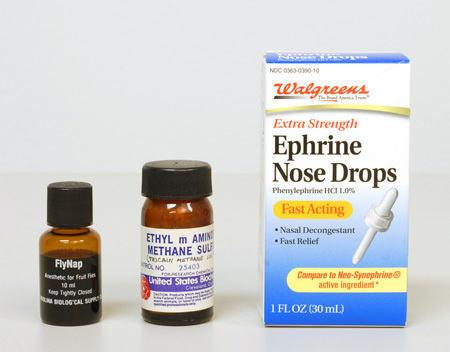 When looking for this product recently, I noticed that Walgreens sells their own house brand of the active agent, phenylephrine hydrochloride 1.0%, in convenient dropper form (Figure 5, right). Incidentally, when buying this or any other pharmaceutical in a drugstore, watch for the expiration date, which will be printed somewhere on the container, and if the contents are transferred to a smaller container for field use, try to use an amber glass bottle or vial, with Teflon™ (DuPont) liner, and include the expiration date on the label. One-half to one-dram vials of each of several narcotizing agents will be more than enough for a tackle-box field kit (Figure 2). FlyNap. This is an anesthetic for fruit flies, where ethyl ether is not available. Carolina Biological Supply Company supplies FlyNap, whose principal ingredient is triethylamine. Narcotizing agents take effect anywhere from immediately to an hour or more; most seem to work within 10 minutes. Beetle larvae and many nymphs are especially difficult to control; most of the commonly available control reagents are very slow acting. Many beetle larvae survive total immersion in 2% procaine even after one hour! This brings to mind an entry written by “Argala” in the 1873 volume of Hardwicke’s Science-Gossip under the title, “The Cobra, and How I Killed it”. In this tale, the author relates how, as an amateur collector of insects and reptiles, he has found that chloroform always kills butterflies and insects very quickly, but on some species it has no effect whatsoever. He writes that he once poured a quantity of chloroform down the throat of a yard-long young alligator—without effect—and was ultimately able to kill it only by taking a pair of large scissors and cutting the spinal marrow at the base of the head, from inside the throat. The author further relates that about the same time he had an opportunity to obtain a four-foot, seven-inch long cobra for taxidermy purposes. To kill the cobra, he first poured down its throat nearly a wine-glass full of spirits of ammonia; he waited half an hour without observing any effect, then administered a spoonful of prussic acid, also with no results. The amateur then thought he would drown the cobra, and accordingly immersed it and the basket in which it was coiled in the bath, with a weight on the lid of the basket to keep it down. The cobra was left there for three hours, until late in the evening, after which time the cobra was limp. Believing the cobra to be dead, the amateur taxidermist put a noose around the cobra’s tail and hung it by a nail in the bathroom bulkhead to let the water run from its mouth, intending to skin the cobra in the morning. Soon after daylight, when the storyteller opened the bathroom door, he met the cobra, which was coiled into a knot spitting at him with its tongue flickering. The author further relates how, after controlling his astonishment, he again un-hung the cobra, allowed it to uncoil, put it back into the basket, and once more into the bath. After two hours, the cobra was again limp, and given no time for a second resuscitation it was skinned and stuffed forthwith! Fixatives—General. Commercial formalin, a 40% aqueous solution of formaldehyde containing some methanol, has been one of the most valuable fixatives for a very long time. Recently, a number of hazards have been associated with it, particularly the irritating effect of the vapor on the eyes, mucous membranes, and the respiratory system [How times change …. In 1951, as a comparative anatomy student, we received classroom quantities of cats in barrels or drums of formalin; we reached in to make our selection, and continued to keep our animals well-soaked throughout our dissections so as to help keep the fat from becoming rancid, among other reasons]. Hazardous properties have also been attributed to other organic fixatives, including acrolein, gluteraldehyde, and other aldehydes; and to inorganic fixatives containing osmium tetroxide, and the salts of chromium, mercury, and other heavy metals. Still other hazardous compounds associated with fixatives include picric acid, cacodylate, and chloroform. Reasonable care and familiarity with the hazards are the best defense. Lewis (7) describes the hazards and safe handling of the most commonly employed fixatives. Fixatives may also be used as narcotizing agents when used as extremely diluted solutions. For example, a drop of 1% formalin or 0.1% mercuric chloride per 5 ml of culture will narcotize most animals, but these methods do result, ultimately, in death of the specimen, yielding, usually, not more than 30 minutes of observation time. Narcosis is induced not only for slowing aquatic animals for classification, but to relax them slowly to as near an extended or lifelike appearance before adding a preserving fixative – it will be noticed from Table 3 that in most cases, especially with higher forms, the preserving agent is the same as the fixative. Adding preservatives directly to the specimen without first relaxing causes contraction and distortion. A small amount of glycerine (glycerol; glycerin) is usually added to preservatives to reduce or prevent damage to the organisms in the event of preservative evaporation. Chloroform, ether, menthol, camphor, etc. are essentially insoluble in or immiscible with water; it is the diffusion of their vapors through the culture drop that causes their effects. Aquatic Dryopoid beetles (Coleoptera) are generally killed and preserved in 70-80% ethanol. For detailed dissection of internal parts, preserve initially in Pampls’ fluid: 4 ml glacial acetic acid, 30 ml distilled water, 6 ml formalin (40% formaldehyde), and 15 ml ethanol (95%). Transfer to 70-80% ethanol for storage. Adding 5% glycerol (glycerine) to the ethanol keeps the appendages flexible and also prevents complete drying of the specimen if the alcohol should evaporate (8). Freshwater isopods (Asellidae) are preserved in 70-80% ethanol (9). Freshwater crayfishes (Astacidae) are killed in 6% neutral formalin and left in this solution for 12 hours to one week depending on the size of the specimen. They should then be washed in running water and transferred to 70% ethanol or 20-30% isopropyl alcohol. To obtain more relaxed specimens, the crayfish should be killed in 70-80% ethanol and transferred to fresh 70% ethanol after about a week (10). Slowly add carbonated water, ethanol, or a 5-10% solution of chloretone to the water containing the leeches. Add a few drops of chloroform beneath the surface of the water containing the leeches, and cover. Place leeches in a 1% solution of propylene phenoxetol or sodium nembutal. Place leeches in a 4% ethyl ether solution in a stoppered bottle. To fix leeches, mucus should first be washed off if present and then the leeches should be soaked in 10% formalin for 12 hours. To preserve leeches, first wash in water and then preserve in 70-80% ethanol or in 5% buffered formalin (11). Tubificid worms can be preserved in 5% formalin or 10% formalin for sieve samples containing a lot of debris (12). Nematodes may be killed by gently heating the vial of water containing them in a 57°C water bath for 10 minutes. They may be fixed and preserved in 5% formalin. To preserve nematodes for permanent mounts, F.A.A. solution may be used: 8 ml formaldehyde (37%), 1 ml glacial acetic acid, 20 ml ethanol (95%), and 50 ml water (13). Freshwater polychaetes can initially be preserved in 10% formalin but should be transferred to 70% ethanol (14). Freshwater planarians may be killed by adding 2% nitric acid to water containing the planarians. They can be fixed in the following solution: 70% ethanol, 20% formalin, and 10% glacial acetic acid. Planarians should be preserved with 70% ethanol. A way to preserve planarians more naturally is to kill them by pouring a hot fixative, preferably a saturated solution of corrosive sublimate (mercuric chloride, HgCl2) in water or saline, over the planarians while in natural positions. A few drops of diluted acetic acid should then be added, and the planarians allowed to soak for 4-24 hours. The planarians should be washed in water and then transferred through increasing strengths of alcohol until 70-80% is reached (15). Argulus species may be killed in 70% ethanol or 10% formalin and preserved in 70% ethanol (16). Freshwater Naididae can be killed and preserved in 10% formalin. To preserve for microscopy, use Amman’s Lactophenol: 100 g phenol, 100 ml lactic acid, 200 ml glycerine, and 100 ml water. Following this, dehydrate through the alcohol series and clear the specimens for mounting in resinous media such as Canada balsam (17). Freshwater amphipods can be preserved in 70-75% ethanol (18). Marine Invertebrates; should you happen to be working with marine invertebrates, you are fortunate in that an entire publication has been devoted to their narcotization: A Synopsis of Methods for the Narcotization of Marine Invertebrates (19). 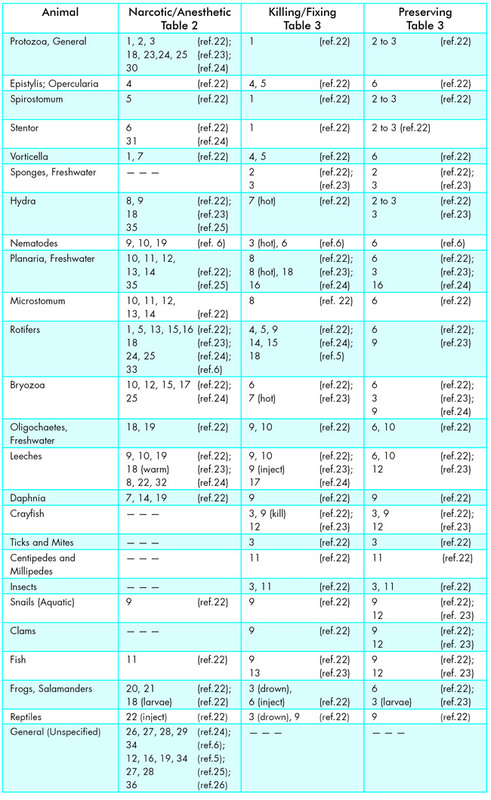 Most of the reagents listed in Tables 2 and 3 here are also listed in that publication, but, in addition, for protozoa, atropine sulfate, benzamine hydrochloride, sodium iodide, and hydroxylamine hydrochloride are recommended–even lemon juice for the Hirudinea (leeches)! Natural History Specimens (General) for the preservation of all classes of natural history specimens it would be hard to beat the two-volume work by Wagstaffe and Fidler, The Preservation of Natural History Specimens (20). The first volume is devoted to the invertebrates, and includes, of course, the microscopic forms that most microscopists will be interested in (Appendix II lists all of the recommended reagents). Volume 2, in addition to including preservation methods for the vertebrates, also treats botanical and geological specimens; the preservation methods for the algae are in this volume. Narcotizing agents: nicotine: Andres (1880); chloroform: Korotneff (1884); ether: Oestergren (1903); alcohol: Eisig (1887); chloretone: Randolph (1900); chloral hydrate: Foettinger (1885); cocaine: Richards (1885); hydroxylamine: Hofer (1890); magnesium chloride or sulfate (1892); carbonic acid gas (soda water): Fol (1885); hydrogen peroxide: Volk (1896). Fixatives: mercuric chloride: LoBianco (1890); 70% alcohol: Mayer (1887); Gilson fluid: Gilson (1895); Zenker’s fluid: Zenker (1894); formaldehyde (1890’s); Bouin’s fluid: Bouin (1897). Those last fifteen years or so of the nineteenth century were very prolific for microscopy – and the same materials are still used successfully even after more than a century. Practical use of the narcotizing and preserving methods tabulated here reveals that they are not of equal effectiveness, ranging from superb to doubtful. They are an excellent starting point for most groups, but it does suggest that the field of narcotizing and preserving life forms is still open to search and research of alternative methods. In fact, this is an area of study that is ideally suited to amateur microscopists and other naturalists, because it merely requires the time to patiently apply untried substances to specific aquatic organisms and record the observed effects. For example, garden insecticides are numerous and commonly available–perhaps sublethal amounts of those which are water soluble would have a narcotizing effect. Likewise, strong sleep-inducing products for the treatment of insomnia could be tried; also rodenticides, strong medications, Merthiolate®, etc. Each microscopist who experiments with these narcotizing agents will come upon their own favorites, depending on the organisms encountered. 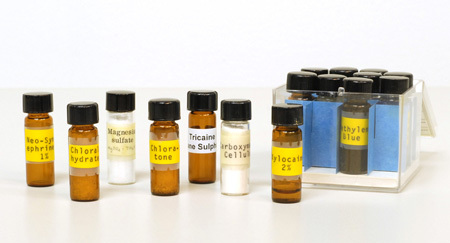 In actual practice, for general limnological work, only six or eight different reagents will be needed for a field kit, including methyl cellulose, alcohol, magnesium sulfate, and phenylephrine HCl, because they are effective, inexpensive, and easy to come by; menthol crystals may also be added. Tobacco smoke can be generated on the spot. Ifpossible, it would also be very nice to include chloral hydrate, chloretone, and tricaine methane sulfonate. With a general selection of this kind, it should be possible to slow down almost any aquatic organism for classification, population studies, or preservation. Delly, John Gustav (2008) Microscopical References for Teachers and Students of Science and Biology, Incorporating Identification Keys for Microscopic Plants and Animals. College of Microscopy, Westmont, IL 60559. Garnett, W.J. (1983) Freshwater Microscopy, 2nd edition. Constable & Company, London. Delly, John Gustav (1976) “Rheinberg Differential Color Illumination in Biomedical Photomicrography”. Biomedical Photography – A Kodak Seminar in Print (N-19). Chapter 1, pgs 3-16. Eastman Kodak Company, Rochester, New York. Delly, John Gustav (1968) “Instant Low Temperatures”. Microscopy: Journal of the Quekett Microscopical Club 31 80. Locquin, M. and Langeron, M. (1983) Handbook of Microscopy. Butterworths, London. Pennak, R.W. (1953) Fresh-Water Invertebrates of the United States. The Ronald Press, New York. Lewis, P.R. (1983) “Fixatives: Hazards and Safe Handling” Proceedings of the Royal Microscopical Society 18 (3) 164-167. Brown, H.P. (1976) Aquatic Dryopoid Beetles (Coleoptera) of the United States. U.S. EPA Water Pollution Control Research Series 18050 ELDO4/72. Williams, W.D. (1976) Freshwater Isopods (Asellidae) of North America. U.S. EPA Water Pollution Control Research Series 18050 ELDO5/72. Hobbs, H.H., Jr. (1976) Crayfishes (Astacidae) of North and Middle America. U.S. EPA Water Pollution Control Research Series 18050 ELDO5/72. Klemm, D.J. (1982) Leeches (Annelida: Hirudinea) of North America. U.S. EPA Water Pollution Control Research Series 600/3-82-25. Stimpson, K.S., Klemm, D.J., and Hiltunen, J.K. (1982) Guide to the Freshwater Tubificadae (Annelida: Clitellate: Oligochaeta) of North America. U.S. EPA Water Pollution Control Research Series 600/3-82-033. Ferris, V.R., Ferris, L.M., and Tjepkema, J.D. (1976) Genera of Freshwater Nematodes (Nematoda) of Eastern North America. U.S. EPA Water Pollution Control Research Series 657-695/6103. Foster, N. (1976) Freshwater Polychaetes of North America. U.S. EPA Water Pollution Control Research Series 18050 ELDO3/72. Kenk, R. (1976) Freshwater Planarians (Turbellaria) of North America. U.S. EPA Water Pollution Control Research Series 18050 ELDO2/72. Cressey, R.F. (1976) The Genus Argulus (Crustacea: Branchiura) of the United States. U.S. EPA Water Pollution Control Research Series 18050 ELDO2/72. Hiltunen, J.K., and Klemm, D.J. (1980) A Guide to the Naididae (Annelida: Clitellata: Oligochaeta) of North America. U.S. EPA Water Pollution Control Research Series 600/4-80-031. Holsinger, J.R. (1976) The Freshwater Amphipod Crustaceans (Gammaridae) of North America. U.S. EPA Water Pollution Control Research Series 18050 ELDO4/72. Smaldon, G. and Lee, D.W. (1979) A Synopsis of Methods for the Narcotization of Marine Invertebrates. Natural History 6, Information Series. Royal Scottish Museum, Edinburgh, Scotland. Wagstaffe, Reginald and Fidler, J. Havelock (1955, 1968). The Preservation of Natural History Specimens. Volume 1 Invertebrates (1955); Volume 2 Vertebrates, Botany, Geology (1968). Philosophical Library, Inc., New York. Anon. (1959) Preserving Zoological Specimens; Narcotization, Fixation and Preservation. Turtox Service Leaflet No. 2. Chicago Biological Supply House, Chicago. The parent company is no longer in business; biology teachers may have these leaflets on file. Morholt, E., Brandwein, P.F., and Joseph, A. (1958, 1966) A Sourcebook for the Biological Sciences. Second Edition. Harcourt, Brace, & World, Inc., New York. Ward, H.B. and Whipple, G.C. (1959) Fresh-water Biology. Second Edition edited by W.T. Edmondson. John Wiley, New York. Pantin, C.F.A. (1964) Notes on Microscopical Technique for Zoologists. Cambridge University Press, Cambridge, England. Latham, V.A. (1909) “Pondlife and New Methods of Narcotizing Polyzoa Rotifera” in Transactions of the American Microscopical Society 67-70 (December 1909). Butyn (Butacaine sulfate). Add 0.1% aqueous solution (0.1-2% freshly made) drop by drop until desired effect is obtained. Pennak (ref.6): 0.1 to 2% solution. Methyl cellulose. An inert, restrictive medium used only to restrain movements. Ref.23: Add 10 grams methyl cellulose to 90 ml water. Mix with protozoan culture 1:1. Tobacco smoke. Invert hanging drop preparation over smoke-filled test tubes. Observe with low magnification for desired effect. Hydrogen peroxide (3%). Add to habitat water. Hydroxylamine hydrochloride. Use 1% solution. Pennak (ref.6): 2% solution. Hydroxylamine – Magnesium sulfate. Make two solutions: 1) 5% Magnesium sulfate, 2) 0.25% Hydroxylamine hydrochloride. Adjust pH of solution No. 2 to 6.4. Then add enough dry magnesium sulfate to solution No. 2 to make 3%. Concentrate organisms in small volume of fluid. Add ½ as much solution No. 1. When specimens again exhibit motility, add same amount of No. 1 solution. After 5 minutes remove most of fluid and add 1/3 this amount of solution No. 2. Methyl alcohol. Add 10% solution drop by drop. Carbon dioxide. Add ordinary charged water to fluid containing specimens. Magnesium sulfate (Epsom salts). Add saturated solution drop by drop. Ref.23: useful for marine forms as well. Chloral hydrate. Add crystals or small amounts of 2% solution to fluid containing specimens. Edmondson (ref.24): 10% solution. Pennak (ref.6): 10% solution. Tricaine methane sulfonate (M.S. 222 Sandoz). Use 0.1-1.0 gram per gallon of habitat water. Acts from 1-5 minutes. Syn. : Ethyl m-Aminobenzoate Methane Sulfonic Acid. Menthol crystals. Place a few crystals on surface of water containing specimens. Apply cover to conserve fumes. Ref.5: Menthol and camphor crystals can be used. Strychnine sulfate. Use 2% solution. Urethane. Use 1% solution. Syn. : Ethyl carbamate. Hanley’s solution: 90 ml water, 10 ml ethyl cellosolve, 0.3 grams Eucaine hydrochloride. To every 10 ml of culture fluid add 1 drop. Repeat at 10 minute intervals until desired effect is obtained. Cocaine hydrochloride, 1% solution, 2 parts; methyl alcohol (70%) ½ part; distilled water 4 parts. Butyn (betacaine sulfate) or hydroxylamine hydrochloride may be substituted in strengths one-half as concentrated. Edmondson (ref.24): 0.25% to 1.0% cocaine in water or 10% ethyl alcohol. He also reports the modification for gastrotrichs (similar to rotifers), using powdered cocaine: the gastrotrichs are confined in a small drop of water, and a minute amount of cocaine is applied with a fine needle dipped into powdered cocaine. Pennak (ref.6): 5% solution cocaine or Novocain in water or alcohol. Ref.5: 3 ml 2% cocaine hydrochloride and 1 ml 90% ethanol in 6 ml distilled water – to which one may add Eucaine. Menthol and Chloral hydrate (Galligher). Grind to a paste one teaspoon of menthol crystals with a medium-sized crystal of chloral hydrate and a little water. Place specimens in a minimum of habitat water and add enough of the mixture to make a thin layer. Chloretone, 1%. Edmondson (ref.24): 0.1% to saturation (about 0.8%). Pennak (ref.6): 0.1% to 0.6% solution. Latham (ref.26): 1%-5%-10%. Chloroform. Add small quantities to the surface of the water in the form of a spray; cover container. Pennak (ref.6): saturated aqueous equals about 1%. Tricaine methane sulfonate (M.S. 222 Sandoz). Use 1 gram per gallon of habitat water. Use 2-15 minutes for immature forms; several hours to several days for adult forms. Urethane. Pour 5% solution on specimen. Wash in water when sufficiently narcotized. Use 0.25% solution on larval forms. Edmondson (ref.24): crystals may also be scattered on the water. Magnesium sulfate. Add 1% solution to water in which specimens are moving. Neo-synephrine hydrochloride (Winthrop Laboratories). Obtainable in 1% solution at drugstores, is best used as 0.1% to 0.5%. “Many rotifers, completely intractable to cocaine are easily fixed extended …It seems to work best in acid waters, rather poorly in alkaline waters”. Acetone. Add pure acetone dropwise to small volume of water containing organisms. Clove oil. One to a few drops are scattered on the surface of water containing the organisms. After fixation, the animals should be rinsed to remove the oil. Magnesium chloride. Use as 2.5% solution of the hexahydrate in tap water (ref.24). Pantin (ref.25): 7.5% solution of the hexahydrate, MgCl2•6H2O. Magnesium sulfate. Use as 20% of the hydrated form. Menthol. A saturated solution is added dropwise to animals in a small amount of water. A mixture of equal parts of menthol and chloral hydrate may also be used. Nickel sulfate. A 1% solution paralyzes the cilia of protozoa. Nicotine/Tobacco decoction. Leeches are very sensitive to nicotine. Drop few shreds of tobacco into the water with them, just enough to give water faint tint. Narcosis in 30-60 minutes. If decoction too strong they die quickly and contracted. Benzamine lactate. Use 2% solution. Benzamine hydrochloride also recommended. Nicotine sulfate. Use 2% solution (ref.6). Ref.5: 1% solution. Ethanol, 10%. Make-up from absolute alcohol, not from low-grade alcohols with deleterious additives. Add the 10% alcohol a little at a time till the excitation subsides. Eucaine. 0.5% aqueous. Also, 15 grains eucaine in 100 ml water. Methyl cellulose. Add 10 grams methyl cellulose to 90 ml water. Mix one drop with one drop culture (ref.23). Ref.24: Make ring about one-half inch in diameter; drop organisms in middle; cover; many will get trapped near ring. Gum tragacanth. Grind gum tragacanth in mortar. Add cold water to make a thick jelly. Mix with drop of culture (ref.23). Gelatin. Prepare a 2-3% solution of clear gelatin by stirring in cold water and heating gently until dissolved. Allow to cool to room temperature. Mix one drop with one drop of culture (ref.23). Lens paper. Use teased lens paper. Apply fibers to culture (ref.23). Cooling with ice water (ref.24). Freeze (ref.4). Cotton wool; glass wool (ref.2). Gum Arabic. Add water to make a paste. Mix with drop of culture (ref.2). Schaudinn’s Fluid. Mix 40 ml mercuric chloride (corrosive sublimate), saturated aqueous, with 10 ml alcohol, and add 1 ml glacial acetic acid just before use. Use at about 70°C. Pennak (ref.6): 66 ml saturated mercuric chloride, 33 ml alcohol, 1 ml glacial acetic acid. Alcohol, 50%. 50 ml alcohol; 50 ml water. Alcohol, 70%. 70 ml alcohol; 30 ml water. Osmic acid (Osmium tetroxide, OsO4). Add 1 ml osmic acid, 2% aqueous to 9 ml water. CAUTION. DANGER. Olney’s nitric acid fumes. To about 1 ml concentrated nitric acid in a small ground glass stoppered bottle; add a piece of copper scrap. Invert hanging drop over fumes for 20 seconds. Rinse specimen. Replaces osmic acid fixation (number 4, above). Formalin, 5% solution. Add 5 ml formalin (full strength, 40%) to 95 ml water. A general fixative and preservative. Bouin’s fluid. Add 20 ml formalin (full strength, 40%) and 5 ml glacial acetic acid to 75 ml picric acid, saturated aqueous. A general fixative in histology and embryology. Gilson’s fluid. To 880 ml water add 20 grams mercuric chloride (corrosive sublimate) crystals, 4 ml glacial acetic acid, 100 ml alcohol, and 1.5 ml concentrated nitric acid. A general fixative. Formalin, 10% solution. Add 10 ml formalin (full strength, 40%) to 90 ml water. A general fixative and preservative. Zenker’s fluid. To 100 ml water (distilled), add 5 grams mercuric chloride (corrosive sublimate) crystals, 5 ml glacial acetic acid, 2.5 grams potassium dichromate, and 1 gram sodium sulfate crystals. A general fixative. Carl’s Solution. Insect preservative. To 280 ml water, add 175 ml alcohol, and 60 ml formalin (full strength, 40%). Add 20 ml glacial acetic acid just before using. Less than 50 ml glycerine may be added to prevent drying in event of preservative evaporation. Formalin, 8% solution. Add 8 ml formalin (full strength, 40%) to 92 ml water. Osmic acid. 0.25% solution used after relaxation when especially fast fixation is needed, as with rotifers. CAUTION. DANGER. Boiling water. A large number of organisms are placed in Syracuse dishes somewhat less than half full. An equal amount of boiling water is suddenly poured into the middle of the dish after the organisms have had time to become extended. Nitric acid. Drop 2% nitric acid on planarians as they are crawling in a minimum of water. Percentage may need to be varied. Immediately after death, flood with fixative consisting of 0.7% sodium chloride saturated with mercuric chloride (corrosive sublimate). Then, after ½ hour, wash-out with water and run up to 70% alcohol to which iodine has been added (to remove any remaining mercuric chloride). Weak acid, such as Lemon juice. Hydrogen peroxide. 1-2 drops of a 3% solution added to 1 ml water containing them will kill rotifers. I am a pre-service science teacher and am looking for different methods of controlling movements of water organisms specifically for microscopic viewing. I also am doing quite a bit of self research on drosophila and flour beetles at my home. This has been a big help. Thank you. Bob, thank you for letting us know. We're glad the article has been helpful. Very comprehensive manual. Thanks from Russian colleagues!